The 28 metre motor yacht Tommybelle has been sold with Richard Tilley at Sunseeker London acting for the buyer and seller. Built in GRP by UK yard Sunseeker International, Tommybelle was delivered in 2012 as a Sunseeker 28 metre model. A sumptuous interior in black American walnut accommodates eight guests in four cabins. There is a master suite, a forward VIP suite with separate access and two guest cabins configured as a double and a twin. All cabins have full en suite bathrooms. In addition, there is a generous saloon with a starboard balcony and huge wraparound panoramic windows, as well as a dining area with an open galley adjacent to the seating area. The flybridge is the place to head for to enjoy al fresco entertaining and evening cocktails, with a wet bar, comfortable seating, Jacuzzi and a GRP hard top with a retractable canopy and an aft extending canopy. She comes fitted with absolutely every extra, including a saloon balcony, stabilisers, hard top, flybridge crane, Jacuzzi, System Orca audio visual, air conditioning upgraded to tropical specification and much more. Twin 1,950hp MTU engines give her a cruising speed of 21 knots, topping out at 28 knots. Sales of this model have gone from strength to strength since her launch at the 2012 London Boat Show. 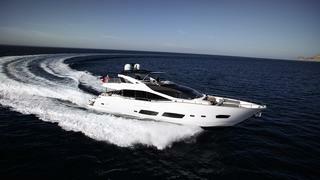 By the end of 2014, nearly 30 units in total had come off the Sunseeker 28 metre production line. Lying in Port Gallice, France, Tommybelle was asking £3,495,000 with tax paid.